Be the Party Animal with the All-In-One Party Strobe Light app! Adjustable color Strobe with 7 extras, great for parties and fun! Includes a bright flashlight, many cool special effects and text flasher. Color, brightness and strobe speed are fully adjustable. Mesmerize your friends with our psychedelic, hypnotic, swirling vortex! Amuse yourself with the flashing green lantern or police strobe. Crazy cat eyes seem to be watching you or set the mood with the color shifter. Use the color text flasher to make a signboard like Happy Birthday or Welcome Home. Be the life of the party with this app! Tap Flashlight button for bright white. Tap Flashlight button again to access or hide the brightness adjustment slider. Tap Strobe button to start color strobe light. Tap Strobe button again to access or hide the speed, brightness and color adjustment sliders. Tap Effect button to select various special effects. Tap Text button to display personal text message in large type for high visibility. 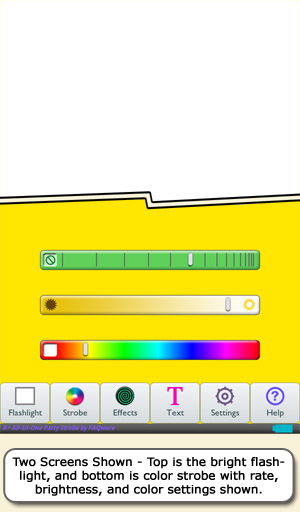 Tap Text button again to access or hide the color adjustment slider. When A+ All-In-One Party Strobe Light starts, you can specify the initial active function, such as flashlight, strobe, effect, text or have it return to the last used function. This app comes preset to start as the party strobe light. When the app first starts, an option is available to disable WiFi and save power. When the app exits, the WiFi is resumed to the same state as when the app started. Ability to disable the device�s auto-sleep so this app stays on indefinitely while AC powered or until the battery runs out. Set blinking speed as fast, normal, slow or off for text signboard, green lantern and police car flashers. Enter your own text message. The A+ All-in-One Party Strobe Light defaults to maximum brightness possible with your device. Without a power connection, the battery will drain somewhat faster than normal use. Do not use Strobe light effect in view of persons who have photosensitive epilepsy.